Moonlight cannot be memorized, if it is the last used mode, the next time the light is clicked on, it turns on in Low. I dont care for the UI at all. Strobe is a tripple clic, but only IF you are in moonlight, otherwise, no strobe access.. very impractical imo. 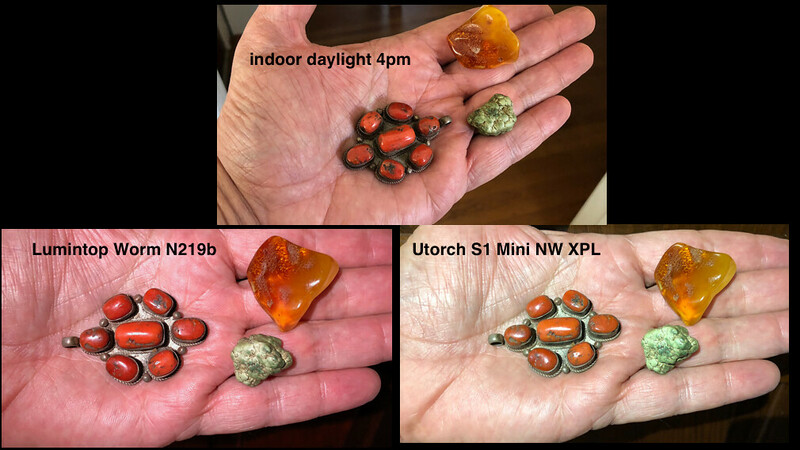 Tint and Red Rendering, Utorch makes red coral look brown, and makes my hand more pale than daylight does. PWM test. 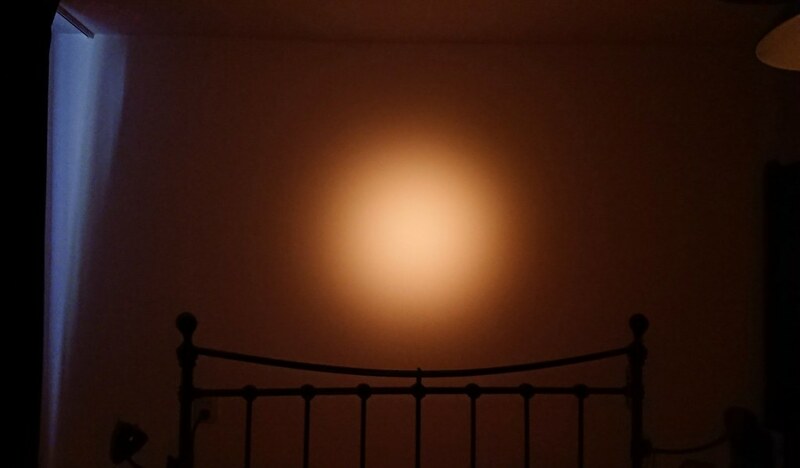 The lights use Constant Current, there is Photographable Flicker or Ripple on the lowest modes, but waving does not show dots. 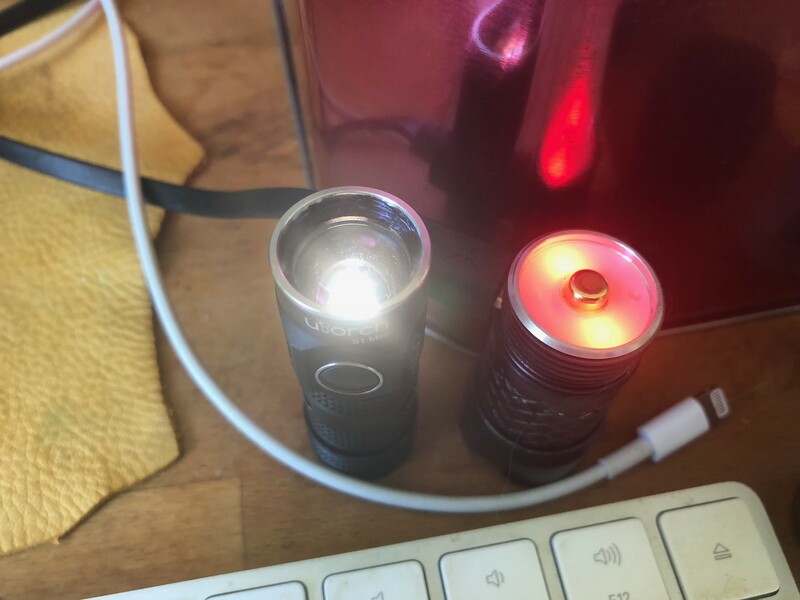 Olight Ripple is about 2kHz, the Utorch is not known, but looks similar. 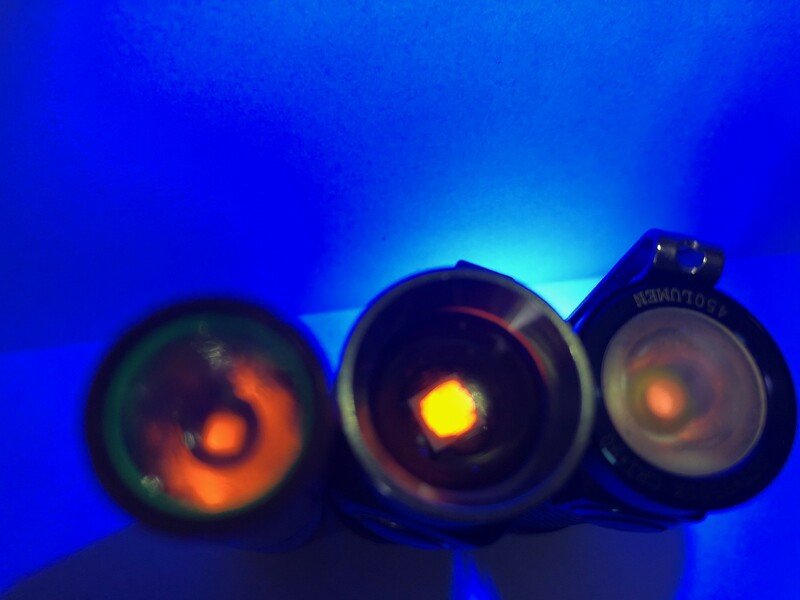 the light on the left is 3000k, the Utorch in the middle is spec to be 5000k, worm on right is spec to be 4000k. Imo the Utorch is warmer than the Worm. 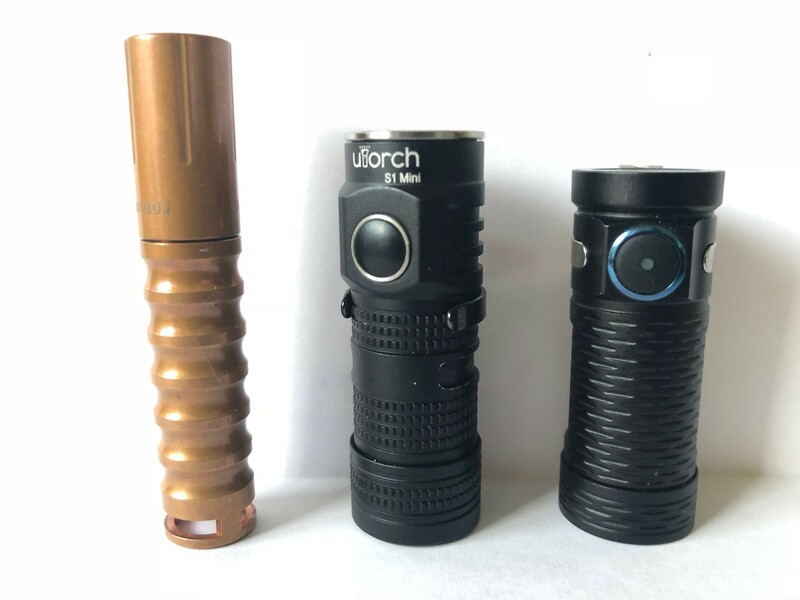 So utorch or Olight, which would you pick to carry regularly? My daughter wanted my first Utorch so I ordered another. Once it arrived I was curious to check out the driver, must’ve screwed something up because the batcheck quit working. No longer trusting the light I left it sitting on my desk where it stared at me. Reminded me of HAL9000 so I put a hyper-red emitter in it and will use it for goofing around since who knows what else I messed up on the driver board. Everything else works fine, but I just can’t trust it any more. I’m afraid it may start singing Daisy Bell. I like the Utorch Flood beam much better for use as a headlamp indoors and illuminating work in my hands. The wide even beam is really useful for close headlamp work! 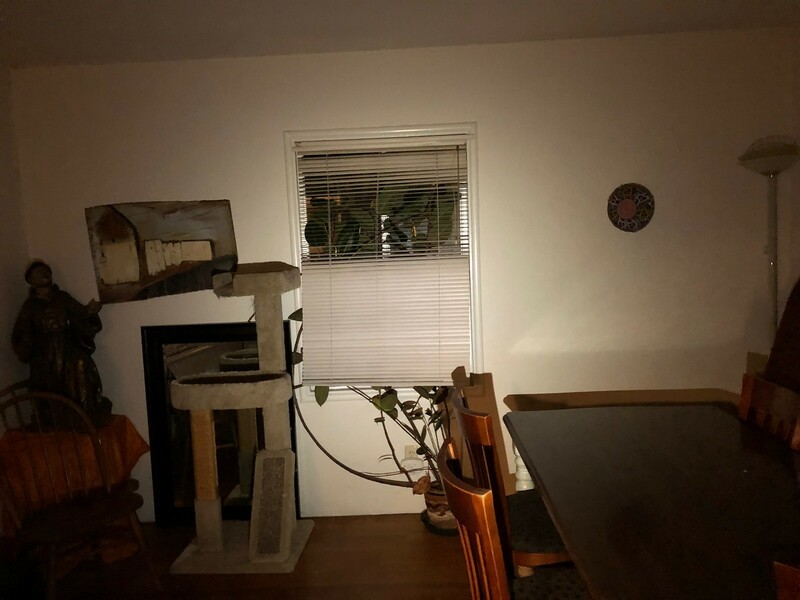 here is the Olight beam indoors, it is a bit of a fuzzy beam, no distinct hotspot Im standing 12 feet from the wall. Otoh, I much prefer the Olight UI, and CRI, and the Low Battery indicator light. I like it better for general use that may include illuminating a parking lot, or things more than 10 feet away. I find the beam too narrow to use as a headlamp at arms length though. 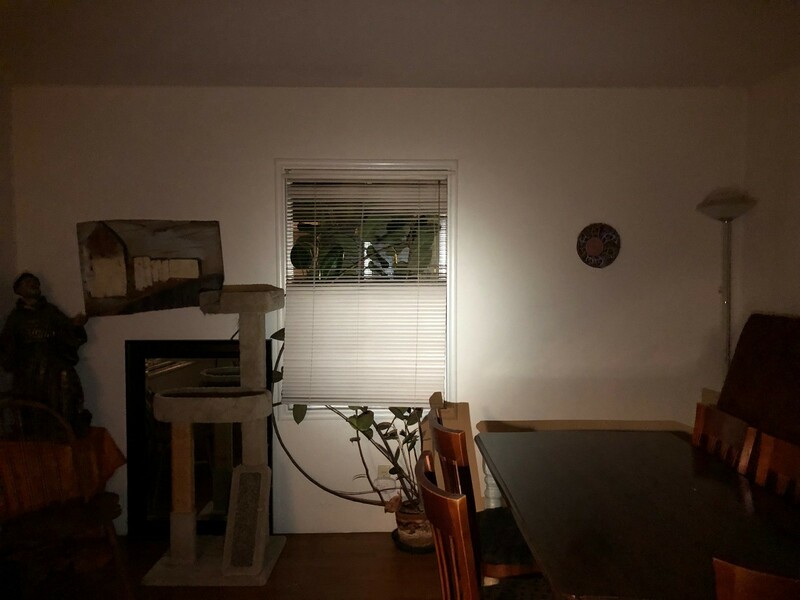 Both lights could be improved with Nichia LEDs, both have nasty tint issues. The Utorch is much easier to mod, and less expensive, except when I buy both and then want to mod them to boot. 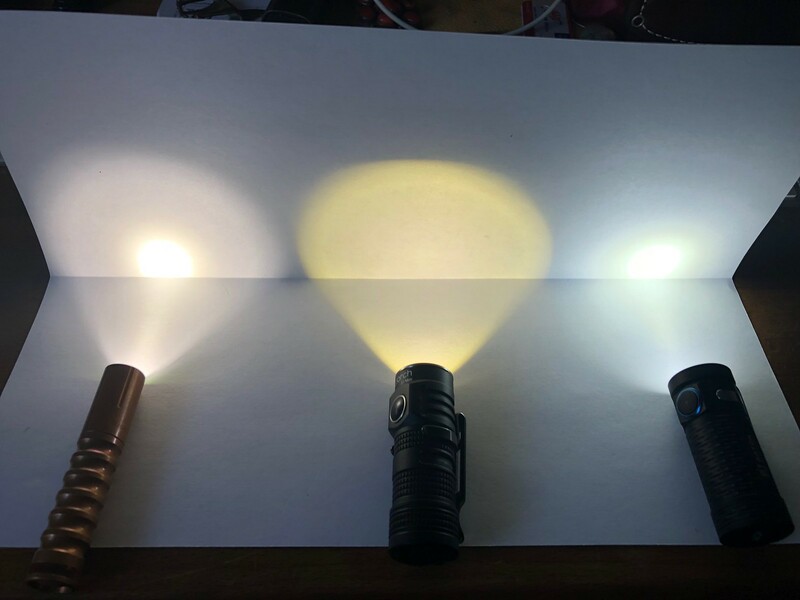 but the Utorch is a specialty beam, for close work, and does not come in High CRI, so if I was going to pick only one, in stock form, it would be the Olight. I’m afraid it may start singing Daisy Bell. Lol! I can feel it. Just like in the UT01, it seems Utorch doesn’t know what 5000K is. They should just advertise it as 4000K warm white instead of neutral white. Utorch doesn’t know what 5000K is. They should just advertise it as 4000K warm white instead of neutral white. one more Hand Palm, attempting to illustrate beam shape at arms length. Note the Utorch beam is the most evenly bright, the Olight has a strong overbright hotspot. so does the Worm. 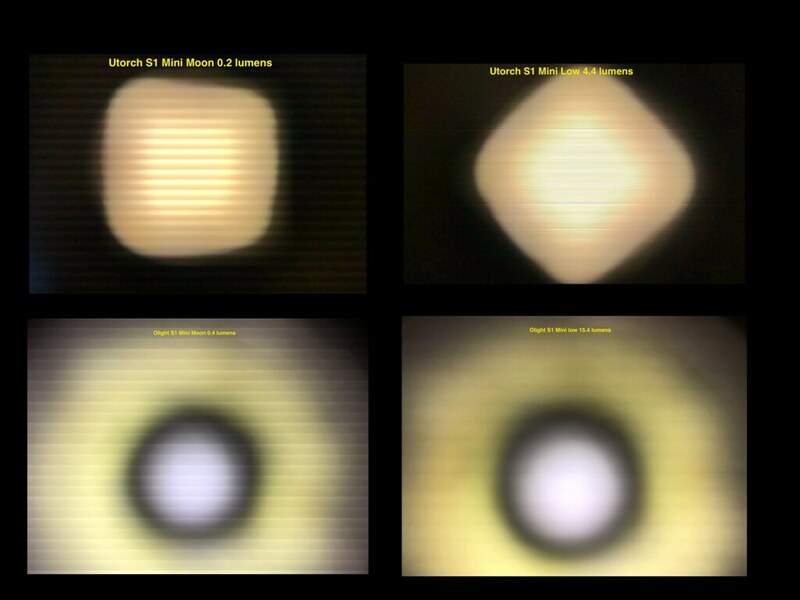 Then note how I “improve” the tint of the Olight with a Lee Filter stuck to the front of the lens w double sided tape. The AssPheric Utorch lens wont let me stick a filter to it. But as bansuri pointed out, the Utorch beam can be improved with a flat lens, and then I could stick a Lee Filter on easily. Im learning that in actual use, even Low CRI can show relative colors in a useful way. The two samples on the right are both Low CRI. FWIW, Im finding the wide beam of the Utorch to be Outstanding for my close range, indoor needs. You can see it does not produce any glare or hotspot in the image. here the bottom right CW light is replaced with the N219b worm, you can see its hotspot is more problematic, and even though the Red pops, it is not necessarily the closest match to the natural light. I also tested the Utorch S1 Mini NW as a wake in the dark for a toilet break. It works great, and does not look yellow in use. Im super happy with the Utorch, and for my uses indoors, and as a headlamp for hand work, its wide beam is the most useful, for me. 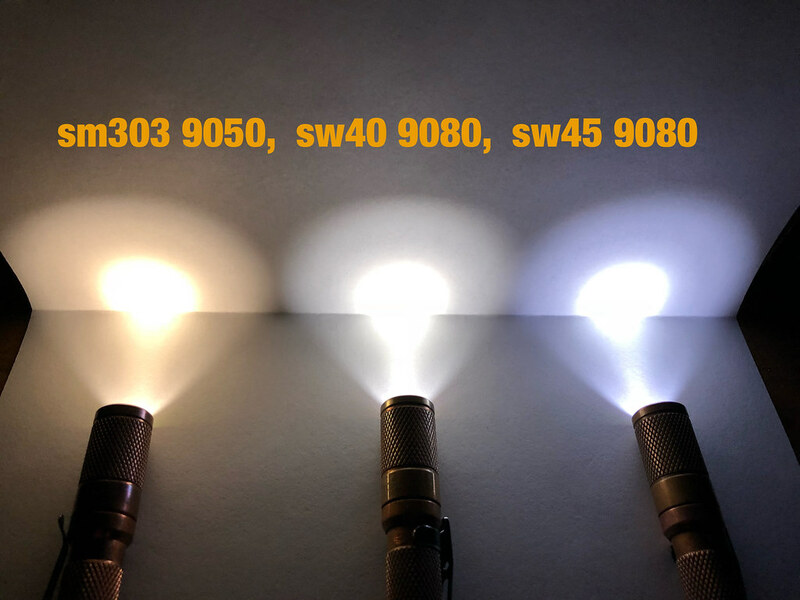 If I was a bicyclist or motorist, stuck in the dark with a flat tire to fix, I would want the Utorch more than the Olight, because the Utorch beam is so consistent and broad. With the other lights, the hotspot forces me to keep sweeping my head to move the glare off the work. Two Thumbs up on the Utorch S1 Mini for close headlamp use. fwiw, there is also a Klarus with the same beam, although the modes may differ. For example the Moon may be brighter. I favor the extra low Moon of the Utorch. One thing I dont like, is that the Utorch will not memorize Moonlight, but, I can get to it with the press and hold shortcut. I dont like that turning the Utorch off requires a long press, I wish it had the Click on Click off UI of the Olight. No perfect light, which is why we all have more than one. Hang on to your wallet! Thanks for doing the comparison. 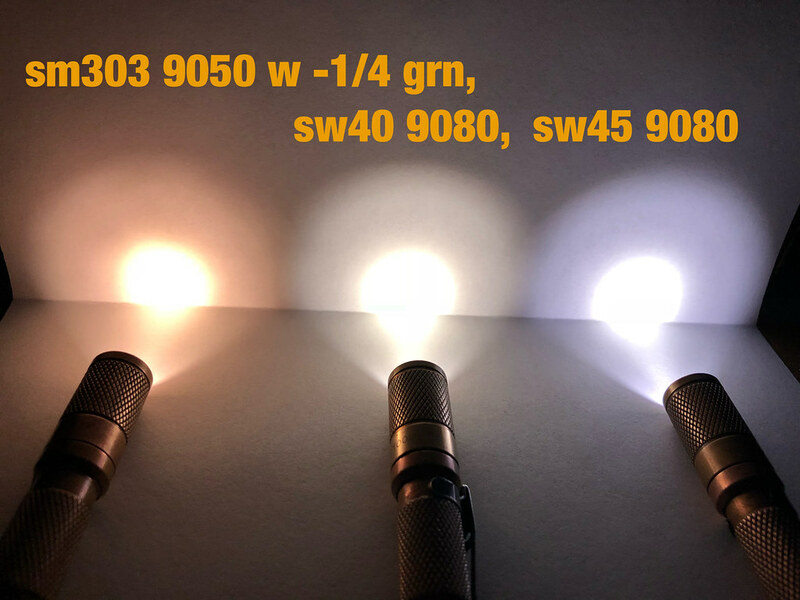 I really prefer true 5000k light. I think I could stand a 4500k light, but that yellow beam of the Utorch would make me angry every time I turned it on! I’d have to try swapping emitters if it were mine. I don’t like that green looking 5500k light from the Olight either, but I could live with it, as I’m sure it’s only noticeable in white-wall hunting. I know 5000k is considered to be the “cool” end of the “neutral” temp spectrum, but it’s the temp that looks the most “white” to me. As for seeing object colors, your pictures really tell a story. 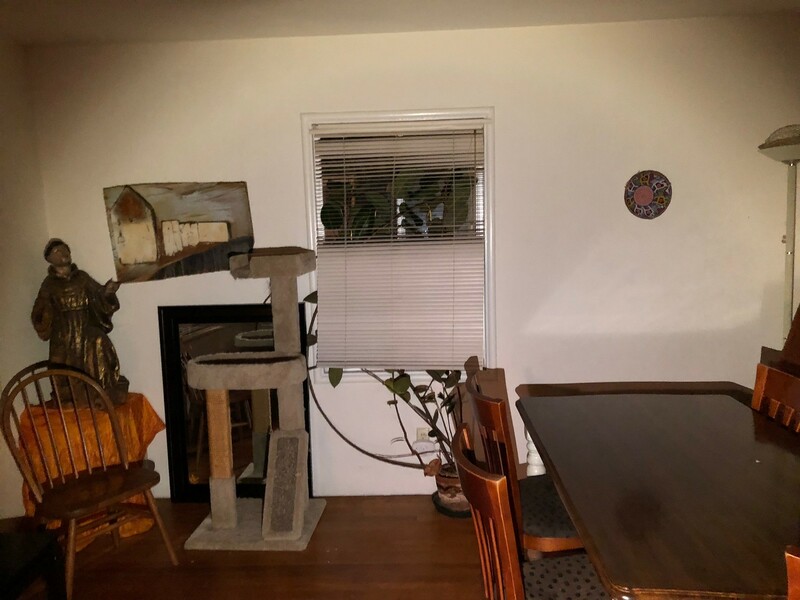 It’s obvious that different lights produce different results. But, as I think you’ve seen, in day-to-day living, any of those would be useful. that yellow beam of the Utorch would make me angry every time I turned it on! in theory, I agree, in real world use, I dont notice.. Im suprised to admit that, but there it is. what I like least about the Utorch is that it does not memorize moonlight, which the Olight does. If I use moonlight on the Utorch and then turn it off, the next single click to on gives Medium! I Hate that! But I can work around it by using the moonlight shortcut, a long press. Another thing I dislike about the Utorch UI is how slow it is to ramp down from Max to low.. same issue with turning it off, there is a bothersome delay before the light goes dark. Im a snob when it comes to photos and colors, but, Im learning that my brain is much more tolerant (unaware) than my camera. Thanks for challenging me to expand my horizons. other Utorch Trivia, the Manual looks almost identical to the Klarus Mi1c, and seem to have similar UI. I prefer the lumen levels of the Utorch Low and Medium. 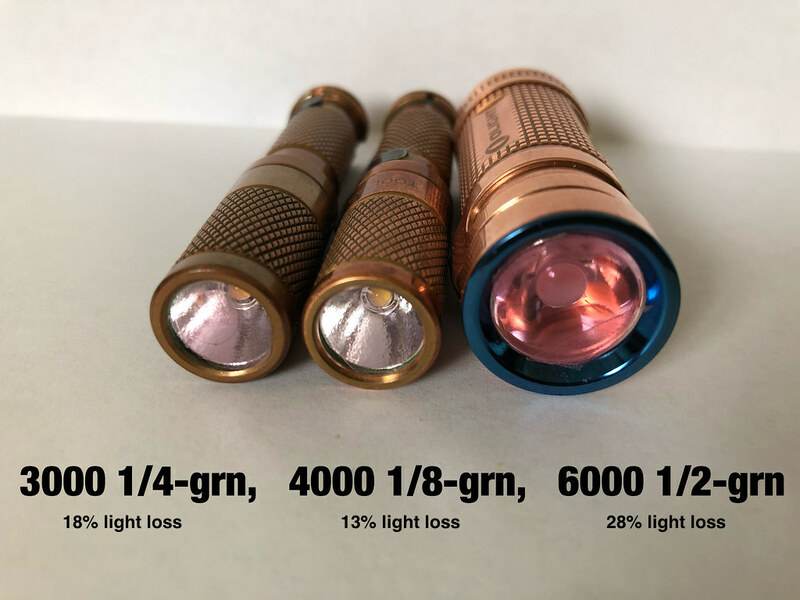 On the Olight, Low and Medium are too similar, I would prefer Olight Medium to be higher. I dont like a lockout that does not make the switch stop working altogether. It is easier to just loosen the tailcap. the Olight has no battery check, but it does turn on a red LED on its switch as a low battery indicator, at 3.39 volts. In both cases the USB battery is protected anyway, so it will cut power, at about 2.7 volts. 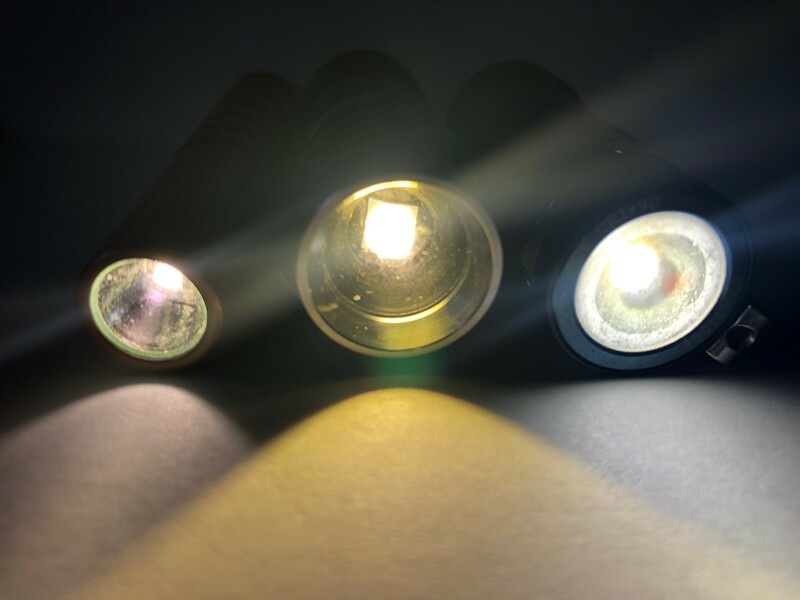 I dont care for the Olight S1 Mini High CRI beam as an indoor headlamp, too narrow and throwy, would be better for a bicycle light and outdoors. If anybody wants to buy my Olight, $40 shipped conus, PM me. 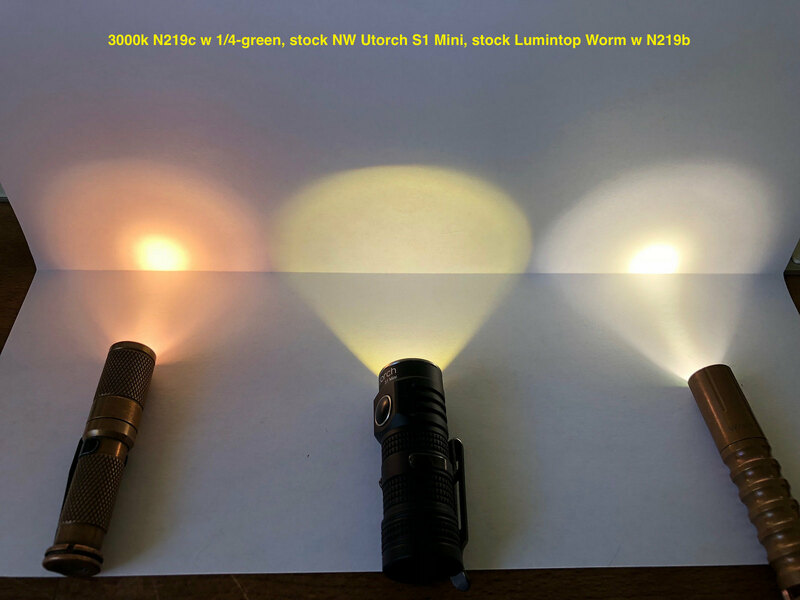 Im really loving the big floody beam of the Utorch, and in actual use, the NW Low CRI with yellow tint, is not that noticeable. Whereas the Olight, every time I turn it on, its just too CW for me. Bear in mind Im sitting under 3000k incandescent at home. And I have a 3000K and 4000k Nichias in my Maratacs. I like Warm lights. I would like a light that color in the wide beam AssPheric version, like the Utorch has. I prefer the modes of the Utorch over the Klarus. And, unmodified, I prefer the NW option of the Utorch XPL, that Klarus does not offer afaik. my newfound love for NW is going to make me consider a Ti S Mini too.. when will it end? Experimenting with a flat glass lens on the Utorch instead of the aspheric. The beam is cleaner with the glass lens, IF I do not install the shiny bezel. To my suprise, the bezel creates a small center hotspot, that I do not want. I may experiment with blacking out the bezel. thank you, very helpful, edited in the NW tag on the Ti S Mini, you are absolutely correct it was missing. I believe on the Utorch that the black centering disk as well as the lens itself, once the bezel is screwed back on, pushes the MCPCB down so the thermal paste can do it’s work. If left without any downward pressure you might run the risk of burning it up if the MCPCB separates from the shelf and has no contact to it. Which it might do if bouncing around in a pocket or what not. I could be wrong but check it out. Don’t want anything giving you the smoke of death or anything. Awesome comparisons by the way. I also picked up the S1A Cu after the S1 mini Cu I got from you and the S1 mini Ti I snatched up. Really liking the extra length of the AA light for my somewhat large and clumsy hands. Thank you for the safety warning, and for introducing me to the Utorch, it’s been a real eye-opener. I will not run the Utorch S1 Mini NW, without the lens on it again :-). Congrats on your Cu S1a, instant classic! I had a titanium S Mini in my Shopping cart at illumn.com today but decided not to pull the trigger because S Mini have no low battery indicator. So then i put an Olight S1 Mini in my cart instead. My buy it now finger was twitching madly but I managed to quell it before it landed on the button. I did not want the Cool White model. Code blacknovember worked for both lights. 30% off always tempts me. Dont tell my wallet about the two other Utorch i ordered on flash sale. Theyre in the mail to Bali for Nichia swaps. 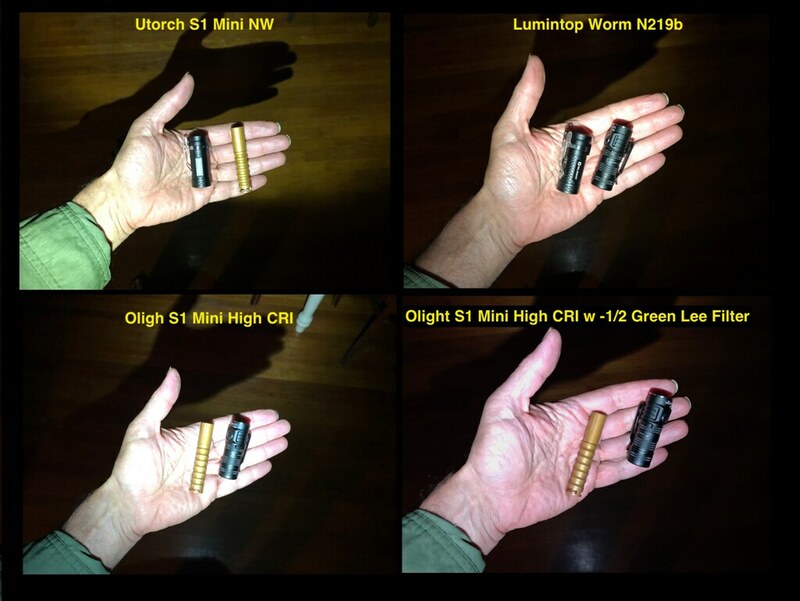 Wish the olights would play w Nichia, the olight UI is so much better. Awesome, I bet that 219 will look phenomenal in that Utorch. I understand about the wallet. I really need to slow down on my purchases. I only have 3 more coming in the mail and haven’t ordered anything lately. Although, I was looking at that Eagletac D25A with the 219 in it. Then again I really want a Klarus Mi7 Ti too. I don’t know. Think I will behave myself for awhile. Looking forward to some beam shots when you get those lights back. I hear TA is one of the best so i’m sure you won’t be disappointed. the lines Tir, aspheric, reflector are double. Just got my Utorch S1 Mini back from Texas_Ace who did a mod to sw45 9080.. Woohoo! Do you really need a minus green filter with that SW40? I like it better with the filter, makes it less yellow. In the evening I find the SW45 cooler than necessary, otoh, during the day the SW45 is not too warm, for me. Thnx! Will look into it. My Utorch S1 Mini w N219b has a problem I have not figured out yet, but it may be related to that thermal paste comment. Several times today, the light has turned itself off after a few seconds of use. When I try to click on, I get either zero light, or a very dim flickering moonlight that will not advance modes if I click. I fixed it once by slapping it half a dozen times. Not reliable. I “fixed” it twice by moving the LED board sideways gently from a couple different directions, in an attempt to smear the thermal paste. It is possible there is poor contact, and the thermal regulation mode is taking over. Not sure yet. this is the first installment in Mystery of the Self Dimming Utorch. I took of the lens and slid the led board side to side a little, and now it works again. I wonder if it would like more thermal paste? It is assembled correctly, to maintain pressure on the black centering ring, with the aspheric lens on top of the centering ring, and the O ring between the lens and the bezel. I dont see any loose solder joints or loose wire. Battery is at 4.0v and the built in Utorch battery check flashes 3 times. The mystery answer will be published shortly. Speculation notwithstanding. Ok, the light worked for the rest of the evening on moon, low and Medium. I did not try turbo. This morning I did a test of Turbo and after 30 seconds the light stepped down to medium. Battery was a 3.9v and the Utorch battery test gave 2 flashes. I tried Turbo again, but after 3 seconds the light turned off and would not turn back on. I discovered the battery was at 0 volts, the protection circuit had tripped. I installed a fresh battery, the light works fine. Charged the battery that was at 0 volts for 1 minute, then took it off charger and measured voltage at 3.9v again. The light works again with that battery. My present theory is that once the light gets to 3.8v, which corresponds with 1 flash of the battery check mode on the light, it wont maintain Turbo, and repeating attempts to run turbo, can trigger the battery protection circuit. Conclusion is, dont fire turbo again if the light steps down to low from Turbo after a few seconds, and the battery test flashes 2 times (3.9v) or less. Next time I cause the light to shut down completely, assume protection is triggered, install a fresh battery. a pic showing the Utorch with fresh battery working normally, while the other battery is being charged (in a PT16 that has built in USB charging). note to self, avoid Turbo and Strobe. Stick to Moon, Low, and Medium. Use the built in battery check, and if it drops to 2 flashes, avoid Turbo and strobe completely. I did another test with the fresh charged battery at 4.1v and the Utorch battery level flashing 4 times. Ran Turbo for 75 seconds, on my light meter, and watched the initial brightness drop to 50% (normal stepdown after 1 minute). Turned off the light, the Utorch battery check showed 3 flashes, and the battery tested at 3.98v on my meter. Moon, Low, Medium, all working normally. moral of the story, Turbo is Not my batteries friend. Now back to our regularly scheduled Flashing.. Happy SunDay!